As the end of summer approaches, what is your strategy to reduce your inventory and bring cash into your business? Many of our best customers leverage direct mail to drive customers into their stores to take advantage of end-of-season deals. We would appreciate the opportunity to talk with you about how direct mail might help you end your prime selling season with a bang. If your business is in a seasonal market then August and September represent the end of your prime selling season. This is your last chance to move significant inventory. If you don't move it now then you will likely be sitting on it or dropping prices further over the next six months. A well-crafted promotion, even if it is just a targeted incentive to your best customers, can help you take control of the task of moving this inventory. In order to have an effective promotion we recommend identifying the bikes that you are most motivated to move. Look for the models that you know are being discountinued or with major technology upgrades in 2018, and at the bikes that aren't moving at regular price. Price those bikes aggressively for your promotion. Look at the aftermarket categories that are season (like summer apparel), are burdened with multiple sizes (helmets & shoes) or where you are overstocked and mark those down as well. This isn't your first year in business and this concept isn't new to you. But you also know that building the pricing model isn't enough. You need to get promotions in front of customers in a way that will motivate them to come shop with you. That's where we come in. We'll help you build marketing messages that appeal to customers around this plan. Our direct mail tools are proven to work for this type of promotion. Direct mail literally puts your brand directly into the hands of your best customers. Most of your competitors rely exclusively on digital marketing to drive sales. 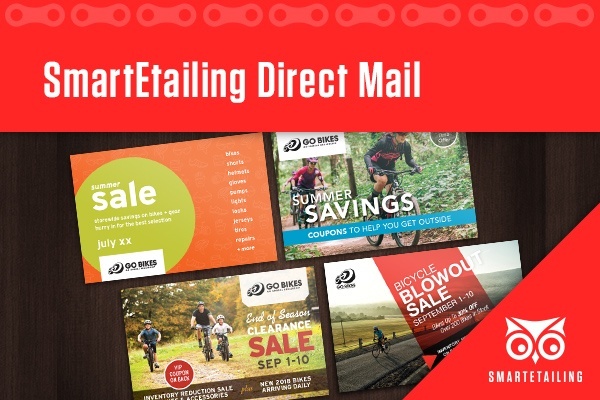 High-quality direct mail from SmartEtailing helps distinguish you from other stores. Your marketing can attract more customers and help you capture more of the dollars spent in your market as the season heats up. Let us create a custom direct mail campaign to grow your business. Learn more about Summer Direct Mail from SmartEtailing.